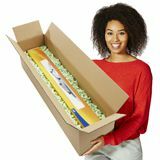 Cardboard long boxes ideal for packing and storage of extra long cylindrical or tubular items such as wallpaper, fabric, rugs, paper rolls, blinds and bundles. Made from strong, single or double wall corrugated cardboard, long boxes allow easy loading while flaps provide extra product protection. Long cardboard boxes are perfect to use with our long polythene bags. Need extra long boxes? - we also stock 61 sizes of long boxes with end opening which can optionally be combined with a lid to create an adjustable telescopic box up to 10 feet long! Still can't find the size you need? - then please have a look at our main box categories before you leave the site. With over 250 single wall and double wall cardboard box sizes in stock (and growing), we're sure to have the size you need. Just click on the orange links.